Between the madness of early morning birdsong, the braying of neighbor’s donkeys and peacocks, the pink-gold sunrise streaming through the forest into my bus, and the intermittent hot flashes where I wake all sweaty, mop down get chilly bundle up and go back to sleep â€” odd and intense dreams keep me entertained. Sleeping in my bus in the forest, my nights are busy. Roshi Joan said, pay close attention to dreams. Not the content so much. Don’t worry about symbolism or story line. But pay very close attention to what you feel in your dreams. What you feel, and how you respond to that feeling, is the core of the dream and the stuff to bring back to waking life. I am staging a massive showing of The Rocky Horror Picture Show . Thousands of people come and fill the stadium. 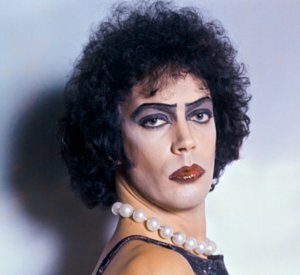 But then, the sound dies right at a crucial scene (when Frank n Furter looks right into the camera and snarls: but maybe the RAINâ€¦ isn’t really, to BLAMEâ€¦) â€“ and so of course, I have to go find the sound guy. I track him to an underground bunker. Everyone tells me, oh, Mark is the sound guy. but you can’t talk to Mark. No one gets to talk to mark, don’t even try. But I manage to break in somehow and meet Mark the sound guy, who turns out to be just like this really friendly, regular-type dude with a blonde mullet hairdo, and it turns out he is also the mayor of the small town where my Rocky Horror screening is taking place. He shows me his silver power drill with multiple light beams that can drill through a wall. It is exactly the tool that we need to fix the sound, so we fly back to the stadium. Some people have left but hundreds still remain, now standing ouside on the turf (it kind of looks like Nat Baily Stadium).Â The audience is singing, and the mad projectionist is screening little home-made animations of parachuting rabbits (i’m not making this up!!). Sound Guy Mark and I are able to start up the movie again. And everyone is happy. I wake up amused. Feeling curious, competent, and ready. Beautiful!!! My rabbits ride on turtles. Thanks for sharing. That WAS like a really good acid trip. Wow, that was worth sharing. Maybe you need to make your mark. Hey! I’m really happy to learn that I’m not the only person who has convoluted dreams! Don’t you get a kick out of them? So, I guess your emotions were in good shape. I’m going to remember to pay attention to the emotions.